The largest ever cycle parade in Russia that will bring together more than 30,000 people from across the country will be held in Moscow on Sunday. The Moscow department of transport told TASS that the event participants will be offered bicycle rental discounts on this day and an extensive entertainment program. 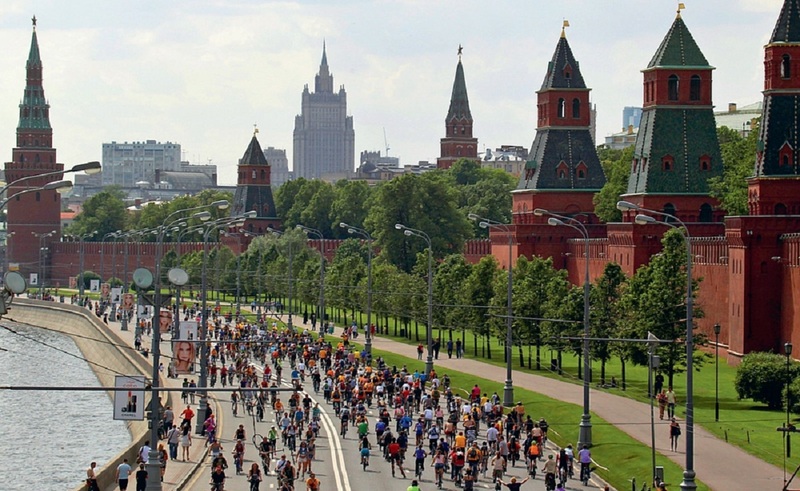 “The participants in the Moscow cycle parade to be held in support of the bicycle infrastructure development will gather at 12:00, Moscow time on Academician Sakharov Avenue on May 29 and will ride a full circle around the Garden Ring around central Moscow. The event is expected to bring together about 30,000 active Muscovites and guests of the city. The event was organized in support of the development of the city cycle infrastructure, it is intended to improve road safety”, the department said. Anyone over 14 years of age can join the bicycle parade – the rules are posted on Moscow’s unified transport portal. The parade participants who don’t have a bike will be able to rent a bike in the city’s cycle rental system at a discount. In addition, residents of suburbs on this day will be allowed to transport their bikes free of charge in commuter trains. Ahead of the start, the cycle parade participants will have an entertainment program. The event’s sponsors and partners will be handing out gifts, arrange free bike wash, organize competitions and games, and the cyclists’ parade will be webcast on the “Window to City” online service. Viewers in other cities will also be able to watch the parade. Not only the cyclists’ column, but also the place of gathering of the parade participants will be webcast. The online service will make it possible to assess the situation in advance at the start of the parade and in the security check area. And motorists will be able to use the webcast to check the road closure on the Garden Ring. There will also be a special “selfie zone” where cyclists can promote biking and on social media. Each selfie-taker will be given a board where he or she can write a dream about the development of cycling in Moscow before taking the picture and uploading it to social media with the hashtag #bikesafety. The organizers expect several Moscow city officials as well as representatives from the French and German embassies to take part along with the general public. Aside from the current parade, two cycle parades are planned in Moscow in 2016 – a night parade on July 2 and another cycle parade is planned to be held on the City Day on September 4. A winter bicycle parade was held in Moscow on January 9. Because of traffic restrictions, the only entrance to Academician Sakharov Avenue will be from the Garden Ring. The route of the parade will follow the direction of traffic around the boulevard ring, then continue on to the Garden Ring. The cycling group will be accompanied by police on motorcycles and other volunteers to ensure the safety of all participants. The Garden Ring road will be fully closed during the cycle parade on May 29 in the period from 13:00, Moscow time till the end of the event. Academician Sakharov Avenue will also be closed for motorists from 8:00 to 17:00, Moscow time. Traffic restrictions will be in effect from the Garden Ring to Masha Poryvayeva Street”, the transport department said.